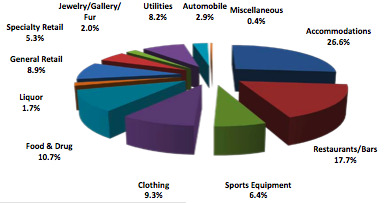 City of AspenThis chart shows how much each Aspen retail category contributed to total sales for the year in 2010. ASPEN – There’s good economic news in the city of Aspen’s monthly consumption report covering retail sales and sales-tax collections. In the report released Thursday, taxable sales in December 2010 hit $67.48 million, a 4 percent increase over $65.12 million in the same month of 2009. As is usually the case, December was the top sales month of the year, besting second-best January by more than $10 million. And, for all of last year, retail sales in the city totaled $466.19 million, also a 4 percent rise when compared with $449.16 million from the previous year. Lodging, which is categorized as “accommodations” in the city’s report, accounted for $123.86 million, or 26.6 percent of all city sales last year. The lodging-sales figure represents a 7 percent increase over 2009’s total. Restaurant and bar receipts rose 3 percent to $82.51 million in 2010, according to the report. That number accounted for 17.7 percent of all city retail sales. Mayor Mick Ireland said the report suggests that Aspen continues to rally economically. He pointed out that the city’s December sales-tax collections – the rate is 2.1 percent of every $1 in sales – rose to $1.43 million, a 6 percent increase compared with December 2009. For all of 2010, sales-tax revenues outpaced what the city budgeted by 7 percent, Ireland noted. The city collected $9.76 million over the 12-month period. The overall increase in collections compared with 2009 was only 1 percent, but that can be explained by a slight decrease in the sales-tax rate starting in September 2009. “We budgeted conservatively for 2010, but the additional revenue is useful, both for building reserves and dealing with issues of need such as childcare,” Ireland said. The reference to childcare was made in light of the growing demand among working families for the city’s childcare-assistance program, Kids First. Pitkin County also faces burgeoning demand for its childcare program. The mayor said that since retail sales and sales-tax collections are on the upswing, he hopes employment figures won’t be too far behind. The lodging figures were particularly promising considering the importance of the resort economy on the city, Ireland said. In 2009, with the recession in full swing, visitors tended to spend less than in previous years once they got to Aspen. The 2010 figures show that trend abating to a degree. “As their optimism increases, they’ll be spending more,” the mayor added.